Overview: When you repeat download a photo/image/picture from network, or repeat receive a song using Bluetooth, or copy a file to another folder but forget to delete the original, duplicate/dupe is produced. The duplicates occupy a lot of Android storage space, it will slow down your file searching speed and prevent you from downloading more music, photo, video or Android apps, it’s difficult to distinguish them one by one. ● Smart selector(Includes Keep the oldest, Keep the newest, Keep the shortest name) helps you to distinguish duplicates and original. ● Smart selector helps you to select the duplicates which have the same folder. 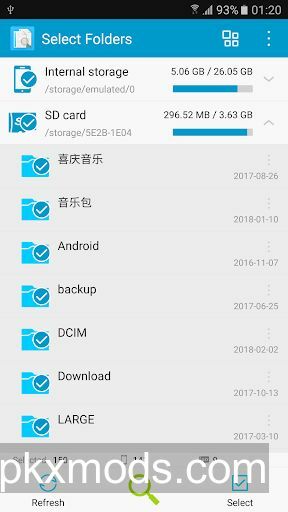 ● Support Android 5.0 Lollipop external SD card. ● Support internal/external SD card/OTG storage. ● Support filtering search results, image/audio/video/document/apk. ● Support filtering file name/file path with regular expression. ● Support excluding search results. ● Support saving and restoring folder selections. ● Support saving and restoring search results. ● Support searching photo/image/picture/audio/music/ring/video/document/apk, media files and all files. ● Support searching photo/image/picture without file extension(hidden/cached image). ● Support searching hidden files/folders. ● Support previewing photo/image/picture(png, jpg, gif, bmp, webp) without file extension(hidden/cached image). ● Notification will be displayed when search complete. ● Search results are grouped by file size. ● View file content before deleting it. ● Each result group contains both original file and duplicate files, deselect at least one file as original file. ● Long click folder chooser/result list to get more operations.